Harry Kane took the headlines from Tottenham’s first Merseyside visit of the season, as he scored his 100th goal for the club from an albeit fortunate strike that lobbed over Jordan Pickford in the Everton goal. The England forward’s 101st Spurs goal, within a minute of the restart, effectively killed the game as a contest after Christian Eriksen had netted the second late in the first half. A back three featuring recent signing Davinson Sanchez encountered few problems at the other end, as Ronald Koeman’s hosts struggled to create meaningful chances. The home side lined up in a 4-2-3-1, with Wayne Rooney, Davy Klaassen and Gylfi Sigurdsson an attacking midfield trio playing behind Sandro Ramirez up front. They looked for Sandro from the start, playing directly over the Tottenham midfield, with the aforementioned three looking to drive forwards from midfield to offer support both outwide and in behind. After an ineffective first-half display from his team, Ronald Koeman replaced Sandro and Klaassen with Dominic Calvert-Lewin and Tom Davies to try and increase their attacking presence. The changes had some impact, but rash decision-making in the final third brought them little success – and the rare set-pieces they won in the vicinity of the Spurs penalty area posed no real threat to Hugo Lloris. Sigurdsson and Calvert-Lewin, their most powerful headers of the ball, had little joy. 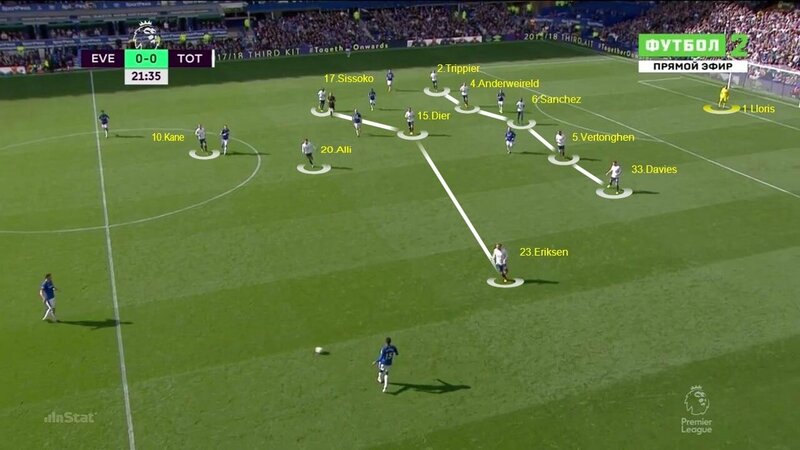 In defence, the Toffeemen struggled with the pace and movement of Mauricio Pochettino’s attackers, who consistently broke in between the lines and easily pulled the hosts out of shape. 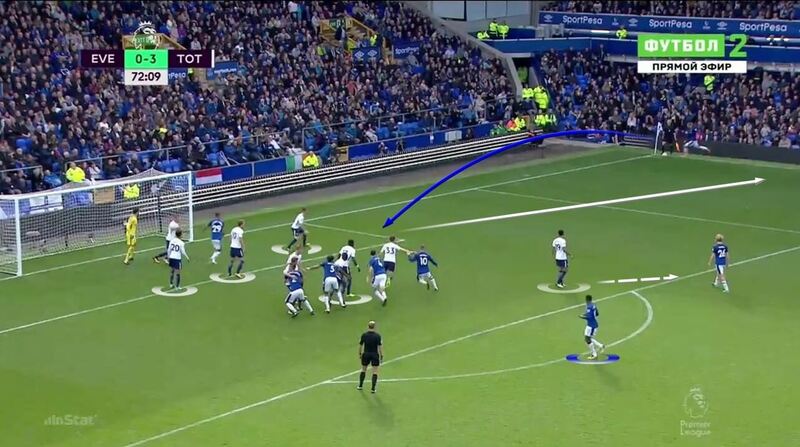 Everton’s failure to press the game and close down space allowed the Spurs midfield more control as the game went on. 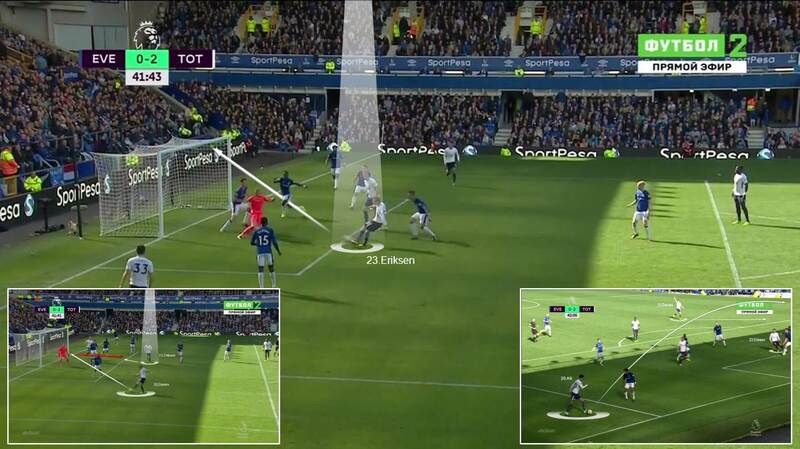 The midfield attempted to mark zonally in central areas and cut off the supply lines from Eric Dier and Moussa Sissoko into Eriksen and Del Alli, but failed – and the spaces the attacking midfielders created were cleverly exploited by Kane. Only when Koeman moved his defenders forward a few metres, to put more pressure on the ball, did the Tottenham supply line dry up slightly. 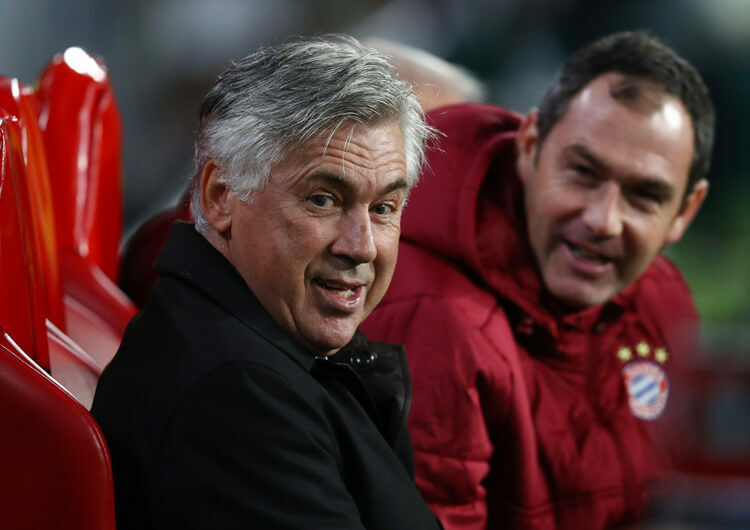 On the counter-attack, they alternated between direct and combination play. In the first half, they would look straight to Sandro or for breakaway runs by the midfielders out wide. After the break, they looked more to Rooney in between the lines; his movement did prove a challenge for the visitors, although Everton’s general lack of proficiency in front of goal meant it was often wasted. The Tottenham formation in defence, with the wing-backs dropping into a back five and Christian Eriksen into the midfield line. Dele Alli and Harry Kane remained further forward to give Spurs options on the counter-attack. The counter-attack from which Eriksen made it 2-0. Alli found space on the right and dragged a centre-back out of position, allowing Ben Davies to arrive on the cross-shot. A well-placed Eriksen scores on the rebound. The link-up between Kane and Davies for the third goal. The former makes a supporting run between the lines and plays the ball out for Davies to attack the free space. 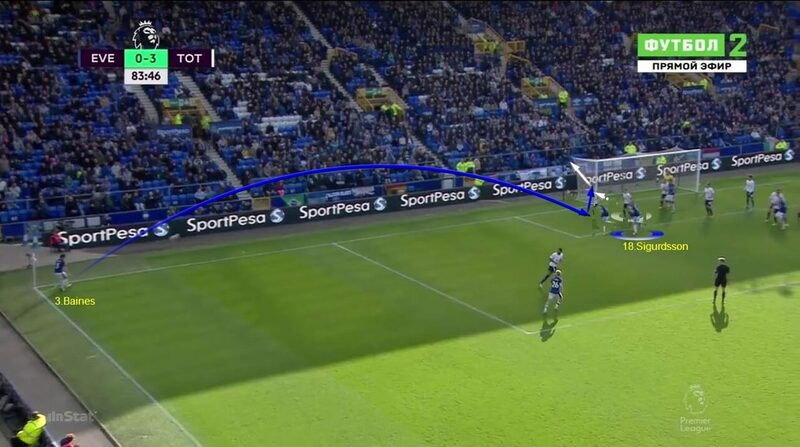 The Spurs defensive shape against direct balls from Everton. A line of five defenders, where Davinson Sanchez is the player charged with challenging the striker in the air. 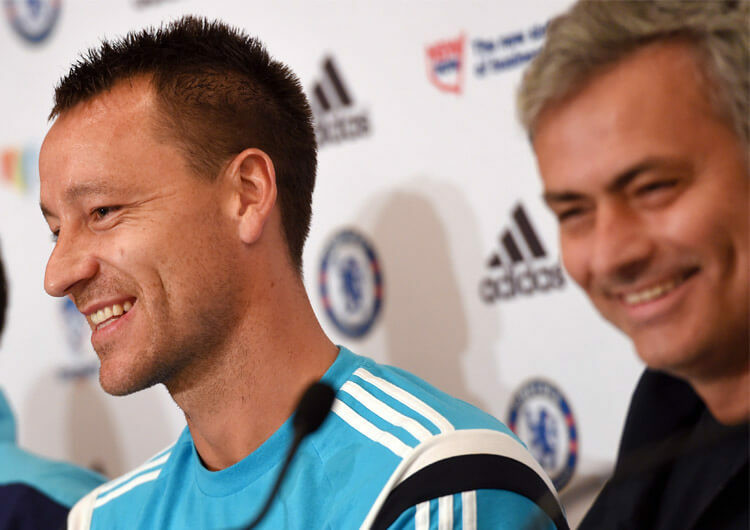 The two central midfielders mark the players who come in support of the striker. Tottenham defending a corner. All the players are back, even at 3-0 up: five man-markers, one on the edge of the area and four marking zonally – three in line with the six-yard box and one on the penalty spot. The Everton defensive system of 4-2-3-1, with Sandro left up top for a potential counter-attack. They leave the wings open, which Tottenham exploited through runs from Davies in particular. 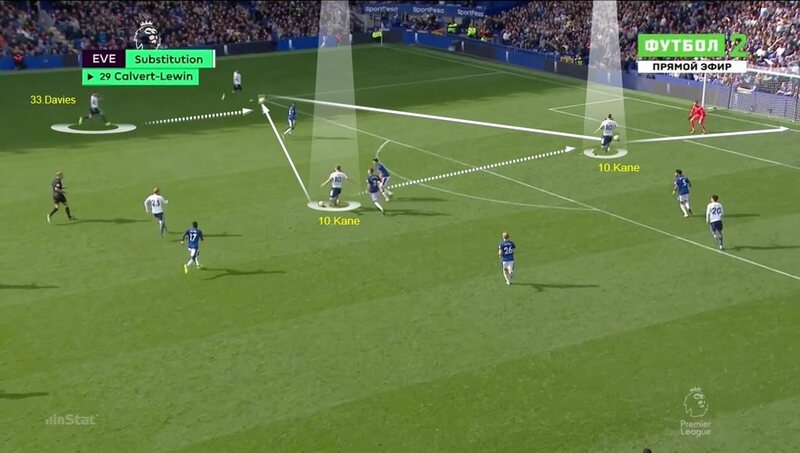 Wayne Rooney was Everton’s most effective player going forward, able to find the gap between his marker and the extra man to receive a pass that beats three defenders. An Everton corner, looking for Gylfi Sigurdsson at the near post. They had little joy in these situations, however, as Tottenham defended the set-piece well all day. Mauricio Pochettino surprised many with the inclusion of £42m signing Davinson Sanchez in a starting 3-4-2-1. The Colombian clearly strengthened the team in their defensive transition, showing both his speed and physical qualities in one-on-one battles. Dele Alli and Christian Eriksen started in attacking midfield positions behind the lone striker Harry Kane. Spurs looked at all times to move the ball into the opposition half quickly, often through the middle in a bid to entice defenders into the centre and leave space for the wing-backs – particularly Ben Davies, who was involved in all three goals – out wide. In the second half, the link-up play between Eriksen, Alli and Kane posed constant problems for the Toffees, and created an increasing number of clear chances for the overworked Pickford to deal with. 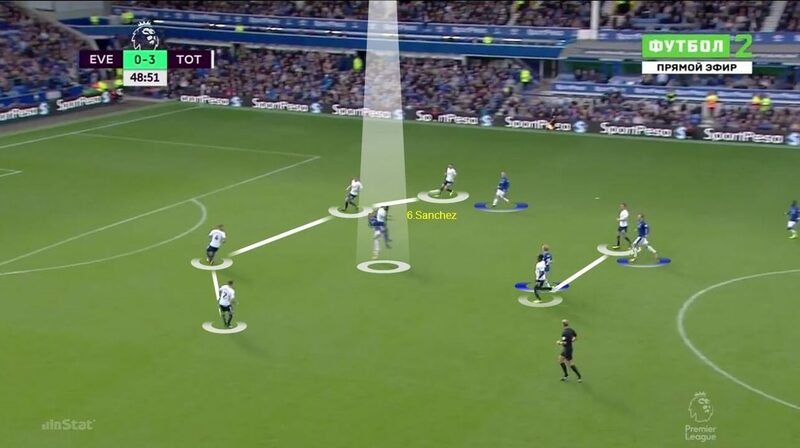 They were rarely troubled in defence, where they shifted to a 5-3-2 in which wing-backs Davies and Kieran Trippier dropped back to protect the wide areas and offer support to the three centre-backs, of whom Sanchez stood out. 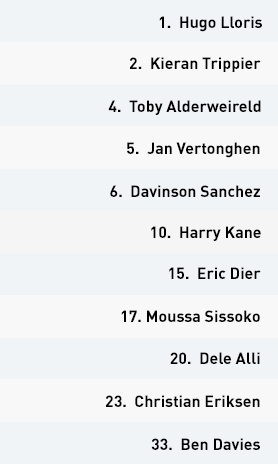 Eriksen dropped back into a more traditional midfield role, leaving Alli and Kane in more advanced positions. Set-pieces caused them few problems, even after the introduction of Calvert-Lewin in the second half. 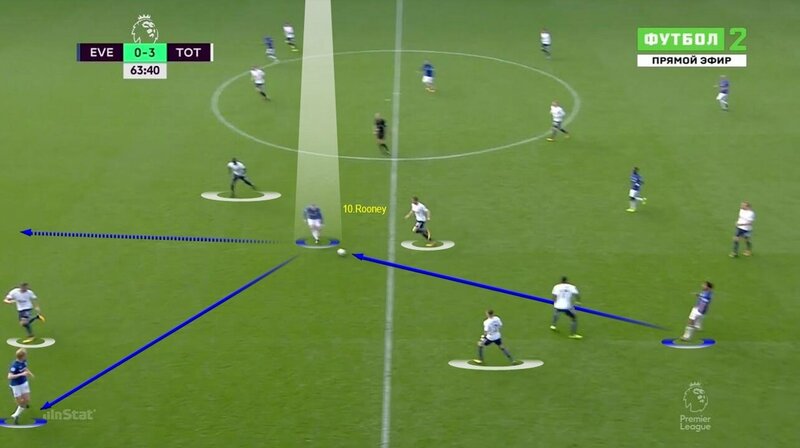 On the counter-attack they deployed a mix of direct play, looking to attack the spaces left by Everton through Kane and Alli, and combination play, with their central midfielders in particular driving the passes. They retained the ball well enough for Davies and Tripper to advance into wide positions, which enabled them to create a more measured positional attack. The effectiveness, as is often the case, of goalscoring centurion Harry Kane in front of goal. The varying rhythms of the Tottenham game, alternating quick passing with the impact of Ben Davies and a more measured approach in positional attacks. The defensive strength of the three Tottenham centre-backs, with Davinson Sanchez the key man. 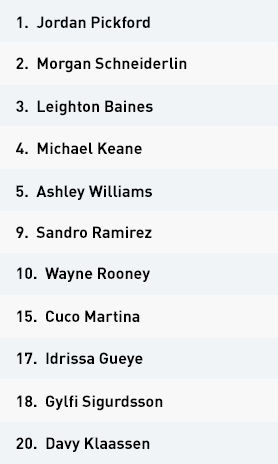 Poor decision-making from the Everton players in and around the Tottenham area. Repeated defensive errors from Everton, which Tottenham were able to take full advantage of.